Our reliable Laners auto-sort your products into lanes, allowing them to be easily packaged or sent in different directions. Typical product from spiral freezers or coolers discharges in no particular order, but SpanTech’s innovative Laner system can straighten out the mess and organize the pile into separate lanes. The system not only accelerates the product into lanes automatically, but also virtually eliminates product jamming. Traditional methods of organizing product flow involved the use of guide rails or sheet metal dividers which caused product residue contamination to the guides or dividers, resulting in drag and slowing down product movement. Products come together, and jamming is usually the result. The Laner eliminates these problems, using multiple rows of specially designed wheels to accelerate product flow. Once aligned into lanes, the product can be sent on down the line for final packaging, or in different directions for additional processing. 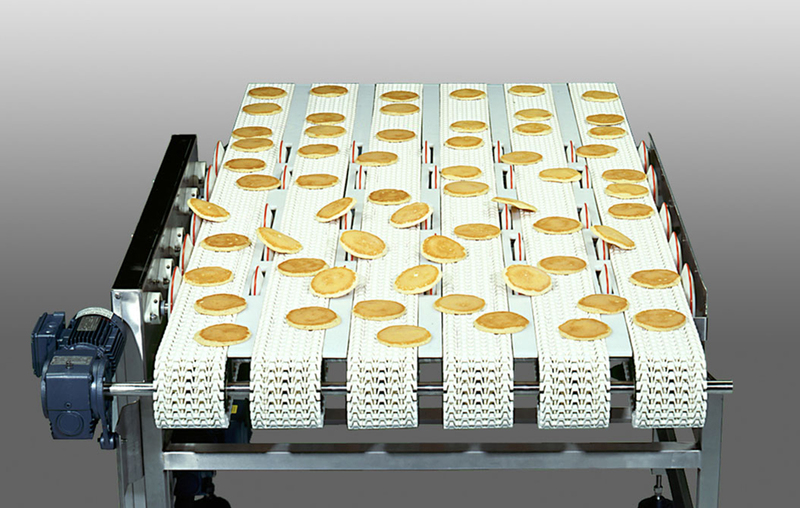 The innovative Laner can take the random discharge of round products and organize the pile into separate lanes. Typically achieve flow rates in the range of 700 to 800 products per minute, and they only use mechanical means to move the product – no sensors are used.